Optimum 20-bit Hi-D transfers from the original 1974 master mixes, cleaned and tweaked to a fare-thee-well. This is the best this album has ever sounded. For those who want their Switched-On's and Well-Tempered's more like the way they first came out, just a LOT better sounding and looking, you've come to the right place. This is the cover (which alone took weeks of work to reconstruct from scratch) and presentation you remember, with additional remarks seen from the perspective of over three decades later. The sound is again in meticulously preserved and restored ultra hi-fi 20-bit audio. Don't confuse this album with any earlier releases. The audio on them was at best two more analog tape generations away from the original master mixes we returned to for these deluxe editions. You can hear these historical breakthrough recordings as they've never been heard before. We think you'll agree it was well worth the wait. SHEEP MAY SAFELY GRAZE from "Cantata No. 208"
A few years went by after the original Switched-On Bach, and the more varied and polished sequel, The Well-Tempered Synthesizer. By this time Rachel Elkind and I had found the opportunity to release an album of completely original new music, Sonic Seasonings, and score Kubrick's evocative film, A Clockwork Orange. These new albums did very well, and in the process, we've been told, we somehow managed to come up with the roots for "new age" music, with the double album, Sonic. Still CBS was besieged with requests for more S-OB. After W-TS we thought we'd finished "proving" ourselves, and that the synthesizer was a serious musical instrument, something that would probably be around for a few years, not a mere fad. But, okay, with some original music behind us, we'd take another look into producing a sequel in name to the first album. That required a great deal of listening and score searching, to discover what of J.S. Bach's Baroque masterpieces might be both adaptable to our instruments, and would also be amenable to the wishes of our new audience. I remember the time as being enjoyable; that we listed several possible selections that might fit these goals. Some of them would need sustained chordal parts, which the monophonic Moog did awkwardly. We also loved the Brandenburg Concerto #5, which would require a significantly better way to handle polyphonic keyboard gestures for the prominent harpsichord solos. Since there were yet no decent polyphonic synthesizers in late 1973, we looked into electronic organs. Um. Quite a usable new instrument was the Electone E-5. There was no velocity sensing, but one manual had a touch vibrato. With several synth like features and controls, it sounded good. Once it had arrived in the downstairs studio, we found it to be an excellent addition for what we needed, especially on the difficult 5th Concerto. I smiled when some years later I noticed that Elmer Bernstein had also used an E-5 for his score to the preliminary and final versions of Ray and Charles Eames' mind-warping film, Powers of Ten. It's difficult to appreciate how limited the tools and palettes were in those days, when today you can find a perfectly usable synth that can provide hundreds of high-quality sounds for only a few hundred dollars. But then we just went about finessing the best we could do with what we had. Listening now I smile to discover how very polished it all sounds, everything is in tune, no fluffs, the playing sounds wiry and flexible, and the sounds playfully dart about the room (well, they do on the original Surround Sound master -- another wonderful idea whose time is finally about to come: music coonceptually designed to wrap around you). I've described before how we worked, starting with click and guide tracks, the tedium of one note or phrase at a time, audible animation, and the tricks we had to develop to gain expression and control. But the listener shouldn't hear any of that -- and no strain is evident. We also had a good time making S-OB II, and I think a lot of the fun still can be heard here, three decades later. I hope you'll share with us in these ultra polished and tweaked remasters, an added second labor of love. Switched-On Bach II was recorded originally on a customized 16-track 2" (M-56) tape machine using Dolby A, then mixed to Dolby surround sound premasters using a four-track 1/2" 3-M. The mixes were edited and transferred using equalization and level optimization to the final masters, mixing down to two-track stereo at the same time. For this new edition we began with the first generation surround premasters. The standards today do not require most of the EQ and gain riding steps used in 1974, so only the main levels were matched to the original releases. This meant we could make an optimum Hi-D 20-bit transfer, and perform these basic adjustments all within a 24 bit environment. From these definitive transfers, a release master was next prepared. All tracks were meticulously fine-tuned, cleaned and optimized over a period of several weeks, as with the other ESD masters in this series. You may rest assured that this is the best these recordings have ever sounded. 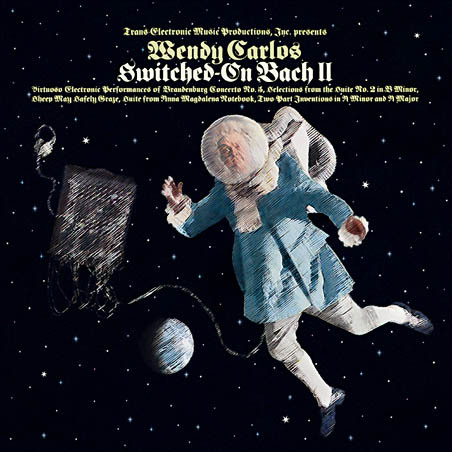 This Special Edition of Switched-On Bach II was assembled by Wendy Carlos. Graphics layout, creative design and supervision by Chika Azuma. All texts and photos (except where noted), illustrations, image processing, audio engineering and CD mastering by the composer.